It’s election time again. Not that voters really have any choices in our community thanks to our Board of (S)Elections and the obsolete Dayton City Charter which put the power of access to the ballot into the hands of unelected political party pogues. When I run for office, all my signs go on private property, with permission of the property owner, as is required by law. 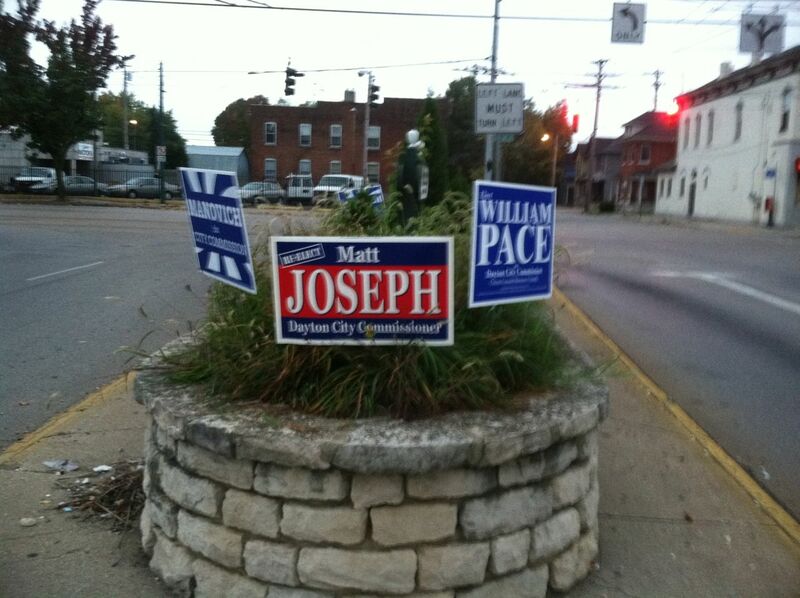 Dean Lovelace, Matt Joseph and the two challengers, Mark Manovich and William Pace all are engaged in placing their signs in the public right of way. I witnessed Russ Joseph (Matt’s brother and a County Employee) placing Joseph signs near the OH4 on ramp off Valley Street the other day- in violation of the law. I even called out to him- “you know you are breaking the law”- and he answered he knew. The City of Dayton is stepping up efforts to remove illegal temporary signs on public property that adversely affect the appearance of streetscapes, neighborhoods and business districts throughout the city.To halt the proliferation of illegal signs, the City of Dayton Street Maintenance crews will remove and dispose of temporary signs located within the public Right of Way, which includes tree lawns throughout the city. Sign removal will occur during the crews’ routine work assignments in the neighborhoods. Examples of illegal temporary signs include real estate signs, placards, and various advertisements placed on utility poles or in the public Right of Way.These kinds of signs are an unsightly blemish on the appearance of our neighborhoods and business districts. The quantity and variety of signs that are cropping up on street corners and along roadways are a distraction, and they can pose a visual barrier to motorists. We must discourage this practice for the sake of our neighborhoods. Considering we just passed an ordinance that makes it illegal for the homeless to hold a sign (after we already required them to get a permit to beg) and have had such great success at moving them off our corners, I believe the same standard should be applied to political candidates. At $250 per sign or 30 days in jail for each sign, we’d be out of debt and idiot candidate free in no time, since the sentences would have them all incarcerated for at least 4 years. Of course, the panhandling law didn’t solve the problem for the region- it just moved it around. 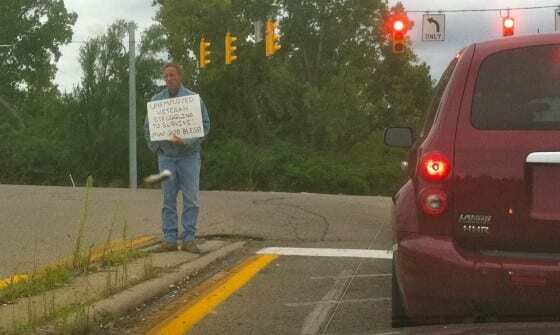 Here is a picture of a panhandler holding a sign on the 675 off ramp to Col .Glenn next to Dave Dennis Chrysler the other night. I hate to tie yet another post back to the #occupy movement, but this is yet another example of politicians holding themselves to a different standard than their constituents. I ask all of you to join me in the lawful cleanup of all political signs in Dayton from public right of ways- center median strips, vacant lots, intersection corners not on private property. I ask the City of Dayton public works department to do their jobs- and the police department to fine and arrest the candidates for breaking the law. Political signs are the lowest form of political speech known to man- saying nothing. If having signs out is the only way the voters know you- you don’t belong in office anyway. It’s time to have real debates, instant runoff voting, deliver equal space in an honest voter’s guide to every voter and move to vote by mail. In the meantime- let’s start by applying their own laws to their campaigns. This has been driving me crazy as well, I appreciate you drawing attention to the matter. I have to say that William Pace is by far the worst offender here. I see his signs in the right of way all over town, he doesn’t seem to care what the law says. I moved a sign of his over the weekend that was in front of Kroger on Wayne, it’s metal base was almost touching the back of curb, clearly within the right of way. You should give them ALL fair warning to collect them before you organize a “clean-up”. If “concerned citizens” collect them, I suspect they’ll just get dumped in the trash whereas the candidates might want to keep them and ideally place them properly. Sorry Hall… they’re well aware of the law… they chose to break it… they lose their signs. A pretty menial punishment in my opinion. They’re all going to end up in the trash eventually / unfortunately. Makes me wonder what other laws will be ignored should they achieve their elected office. Correction to David’s comment; The ordinance does not make it illegal for panhandlers to hold signs. It makes it illegal for them to solicit from motor vehicles in the right of way on public streets. Political signs have been tolerated in the right of way in this region for decades since the window of opportunity is just a few weeks. This is not a new phenomena and pointing fingers is not the solution. Some local municipalities charge a permit fee for the privilege. Even you had some signs in the right of way two years ago despite your personal efforts to avoid this. People were putting them up for you and you cannot fully control where they put them. I will admit that there seem to be more signs in the right of way this year than in private yards though. The question you should be asking since you are a precinct representative member of the Montgomery County Democratic Party is why do the party faithful continue to put signs for the incumbents on lots where properties are boarded up (besides the fact that they don’t need to ask for permission)? Subliminal messaging can be effective. Especially when it associates you with a powerful negative image. Gary, that is something I noticed also. The only signs I’ve seen in people’s yard are for Issue 2. I don’t recall seeing any candidate signs in people’s yards (yet). I am glad to see that you realize that people can’t control where their signs end up. 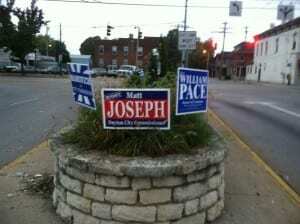 I’m pretty sure that Matt, Dean, Pace, and so on did not personally put any signs out, let alone ones in the right-of-ways. I’m also willing to bet they told people that they’re not allowed in right-of-ways …. just like David surely has told his helpers. Anyway “Mr Mayor”, to repeat what I posted on David’s FB page, the city has asked us residents for helping taking care of vacant properties (we do so ourselves with the empty house next door), you should ask us to do the same with these signs. Saying they’re “tolerated” because of the short timeframe is not an excuse. If that’s the case, repeal the law. @Gary- if I saw one of my signs on the right of way- I took it down. That Russ Joseph knowingly breaks the law- is an indication there is a problem. It’s time politicians started living up to the laws on the books- and it distinctly says no bs signs in the right of way. Screw the decades- you have no problem enforcing the charter which is obsolete- and keeps 40% of the candidates off the ballot and totally makes impossible changes or recalls instituted by citizens due to changes in how voting rolls are counted. A Manovich sign has been up at our corner since the election. I recently emailed him to come and retrieve it.